Mount Rainier is a gigantic mountain. It is one of the most prominent peaks on the planet, and the most heavily glaciated peak in the lower 48. Mountain climbers come from all over the world to climb this 14,411’ tall giant. After two days of waiting out the weather, we started our climb from the Paradise visitor’s center. The first day we hoisted our 55 pound packs and climbed 4500 vertical feet through fog and drizzle to reach basecamp at Camp Muir, just above the clouds. 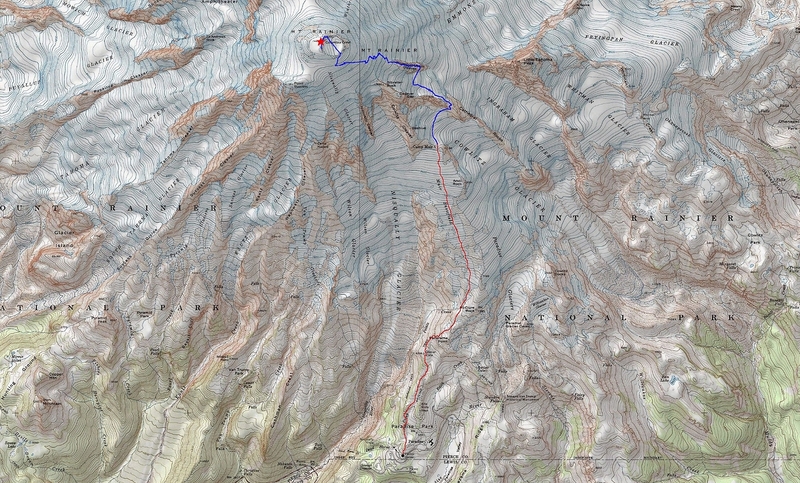 Once there, we set up camp on the snow, and went to work boiling water and getting gear ready for the next day’s climb. The next morning, our alarm went off at 12:45am and we began making our way up the mountain by just after 2am. The clouds had all gone, and we were left under a starry sky, getting a feel the rhythm of glacier rope travel in the dark. Soon enough, our route up the “Disappointment Cleaver” came into view above us. We could see headlamps from the strings of climbers that had started ahead of us. To the east we could see the orange beginnings of what would be an amazing sunrise. In the midst of this grandeur, the surrounding crevasses commanded our full attention. Falling into one of the 100’ deep cracks in the glacier ice could be fatal if the other members our rope team couldn’t arrest the fall. Up we went into the thin mountain air. After 4500’ vertical feet of climbing from basecamp, we arrived at the summit crater. Rainier had blown its top long ago, leaving a snow-filled summit crater the size of a couple football fields. Steam was visible rising from vents around the edge of the crater. After a flat hike across the crater, we made it to the highpoint. We had a commanding position to view the surrounding Cascade Volcanoes like Mount Adams, Mount Hood, and Mount Saint Helens. All amazing mountains in their own right, but they seemed small compared to Rainier. Soon enough it was time to head down. We made a slow and careful descent back to Camp Muir, chatting with other climbers along the way. It had taken us 11 hours round trip from Muir, and we still had to break camp in the scorching sun before making the descent back to the trailhead at Paradise. It was a huge adventure on a huge peak. Basically like climbing a double Mount Borah, with 55 pound packs for the first half of the climb. Probably the most physically challenging climb I’ve ever done, but well worth the effort. Map of the Disappointment Cleaver route, just over 15 miles and 9000' elevation gain round trip. Climbers getting ready to depart from Paradise visitor's center. We wouldn't be alone on the mountain. Climbing up the snow into the fog with our 55 pound packs. Basecamp at Camp Muir, elevation 10,200'. View from Camp Muir. Adams, Hood, and Saint Helens poking up through the clouds. Climber's headlamps as rope teams make their way up the "Disappointment Cleaver" route. The start of a beautiful sunrise. Brady during a rare break in the action. Notice the distant climbers higher on the mountain. 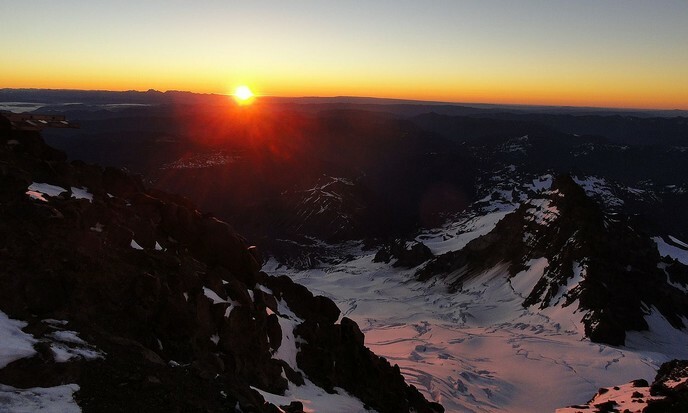 Sunrise view from the top of Disappointment Cleaver, with the Emmons Glacier far below. In line behind other rope teams. Some steam was actually visible coming up through vents along the edge of the summit crater. Mount Rainier summit shot, splattski style. Our group posing on the summit. Looking down on the summit crater. Crevasses on the Ingraham Glacier, with the boot path traversing above. Looking back on the Ingraham Glacier. Watch your step! View up the Muir snowfield on the way back down. View of Mount Rainier during the drive home.